Status: Missing since September 2011, presumed dead. 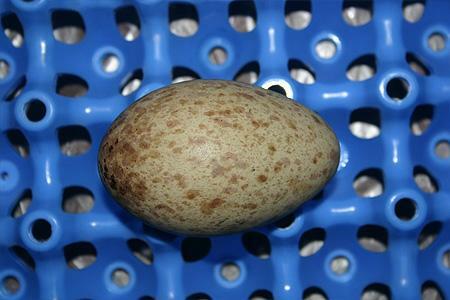 May 2011: Mildred hatched from one of the smallest eggs the day after her sibling Trinny. She had a wonky toe for a while, which was cured through the use of a little tape! 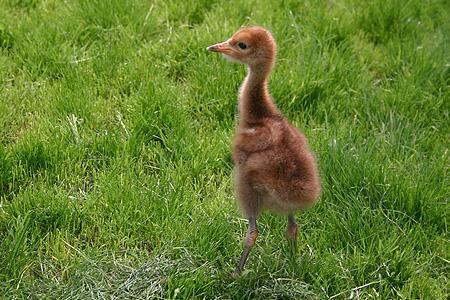 Like her sibling, she is a reluctant follower of the crane head and shows quite an independent spirit. June 2011: Milldred is going through a rather aggressive phase at the moment and has become what can only be described as a psychopathic bully. She seems to be following in Minnie's footsteps from last year. She fights with any and every crane that crosses her path. On a positive note though, she loves eating slugs. July 2011: Mildred has had some growth problems with her legs, and currently has both legs splinted which we hope will help correct some bowing that has occurred. 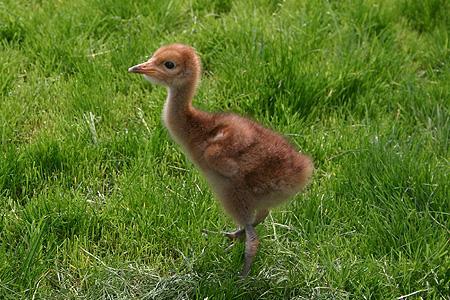 Our fingers are crossed for young Millie - a crane's legs are one of the weakest parts and are so susceptible to problems during their growth. August 2011: Mille is looking good and strong but has a rather alarming looking bent leg, which she seems, however, to cope with very well. 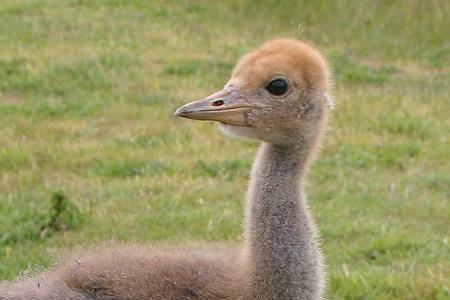 September 2011: Mildred went missing on Sept 7th and her whereabouts were unknown, until she was sighted in Kent, firstly at Stodmarsh NNR and then at Reculver Marshes. She was last seen flying south along the coast on the 20th of September 2011.